Tonight we had the youth from church over for a Back to School Cookout. There was lots of good food and I didn't have to do anything! (That's not totally true. I made sure the house was clean and the kids did most of that!) The youth also had an opportunity to just have down time with each other. At one point there were about 7 people on the trampoline. Scary. They also played a game or two. I think every one had a good time. We'll have to do it again. 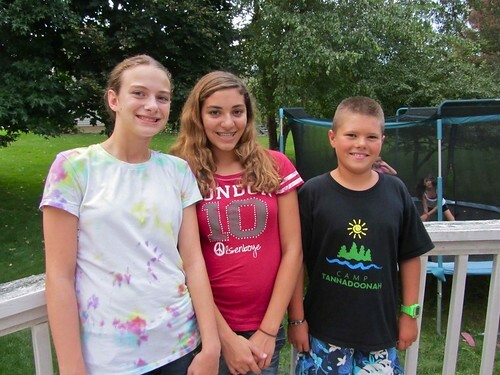 Megan invited two of her friends to the cookout, Julie and Jack. The nice part about having Jack over is Kade got to go to Jack's house to play with Noah. I love to swap kids.